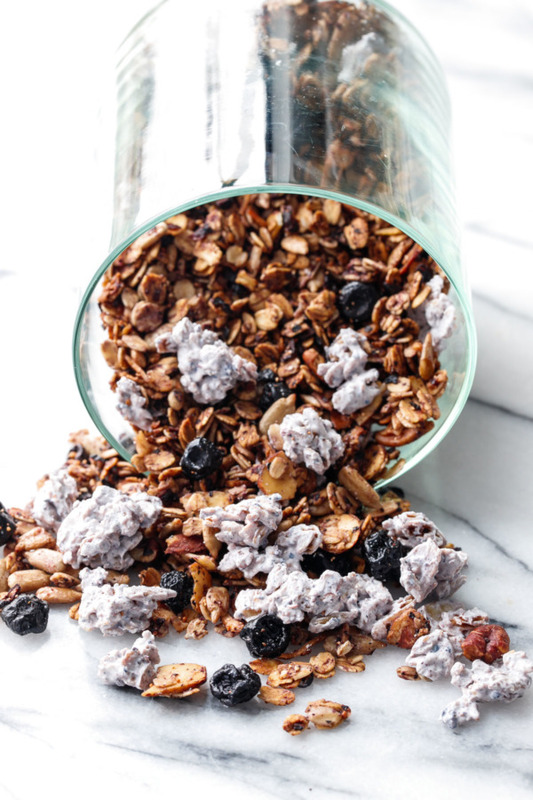 My classic homemade granola recipe gets a fruity twist: with triple blueberry goodness! Blueberry jam, dried blueberries, and freeze-dried blueberries to be exact, plus homemade blueberry yogurt clusters that take this granola from ordinary to extraordinary! 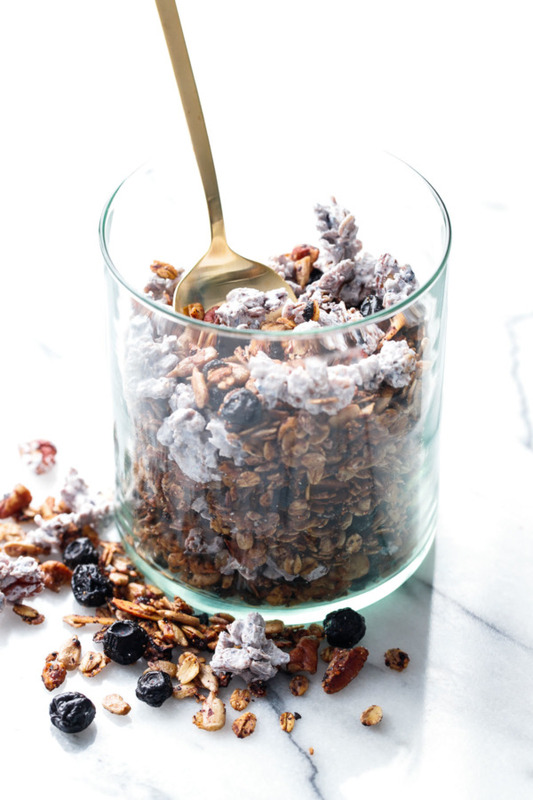 Talk about a unique granola: lightly sweetened with maple syrup and tossed with blueberry jam and ground up freeze-dried blueberries and baked until toasty and golden brown. It’s seriously my new favorite granola, I love sprinkling it on yogurt in the morning or munching on handfuls in the afternoon (where the subtle sweetness is enough to satisfy the afternoon cravings). It’s a recipe I’ve modified before, previously transforming it into toasted almond & chocolate granola and spicy gingerbread granola, but this time, I went all in with the fruit. The granola base is pretty classic, with toasted oats, dried coconut, sunflower seeds, sliced almonds and pecans (though you can mix up the nuts pretty much anyway you like). Toss the oats-n-stuff with a warm mixture of maple syrup, blueberry jam (if you’re using a homemade blueberry jam that’s particularly chunky, I recommend puréeing it first), vegetable oil and a splash of vanilla, then stir until the mixture is completely coated. Oh, and a generous pinch of sea salt! Bake the granola until it’s golden brown, stirring well every 10 to 15 minutes (the edges tend to cook faster than the middle, and you want it to cook evenly). But how do I know when it’s done? Well, the granola will have a slight purple tint from the jam when it goes in the oven; when it’s completely toasted the color will have baked out entirely (which bummed me out a bit, but if you think about it, it’s like a color-indicator of doneness, like those toothbrushes that turn white when they need to be replaced). 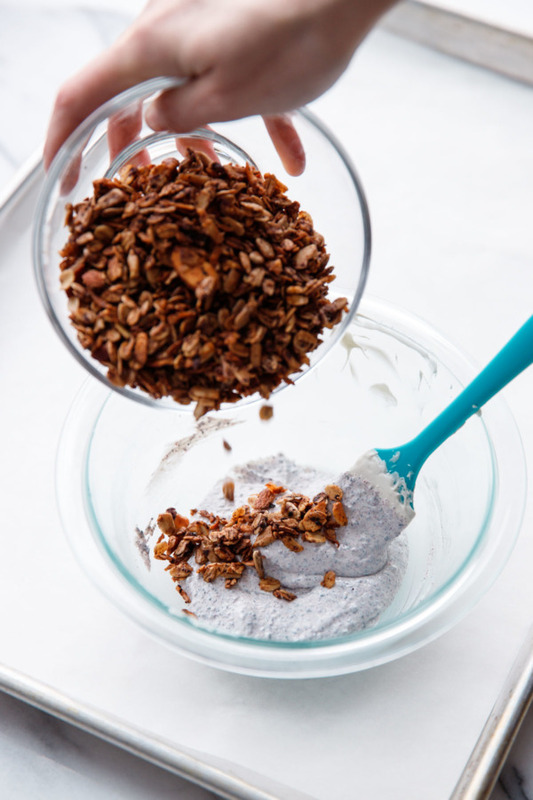 When fully baked, the granola should feel completely dry without any hint of moisture. I found this particular granola takes a bit longer to bake, I think because of the added moisture from the jam. Whereas the gingerbread granola was done in 30 to 45 minutes, this one took upwards of 50 to 60 minutes. I accidentally underbaked one batch in an effort to preserve some of the purple tint, and it wasn’t very crunchy at all (and let’s face it, less-than-crunchy granola is less-than-ideal). But keep your eyes on it, especially in the last 15 minutes or so – you want it deep golden brown, but it’ll still burn quite easily if you’re not paying attention. I made these delightful yogurty clusters by tossing some of the toasted granola with a mixture of melted yogurt chips and more ground up freeze-dried blueberries. Once the granola is evenly coated, drop bite sized bits onto parchment paper and let them set (they’ll firm up in about 10 minutes). You can also break up larger clumps as necessary, then toss with the rest of your granola. 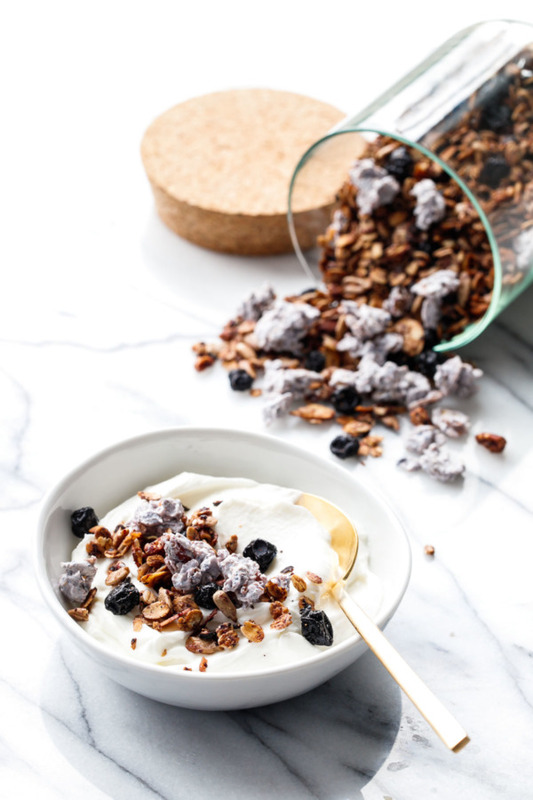 The yogurt clusters are quite sweet, I dialed back the sweetness on the granola itself to compensate, and the result is perfectly balanced toasty goodness with pops of sweetness and fruit. As showcased by my own granola experimentations all based around the same foundation recipe, this one is no different. It’s infinitely customizable to your own personal taste and diet preferences. Choose your own granola adventure! Nuts: I used a mix of sliced almonds and coarsely pecans. But as long as the overall quantity of nuts stays the same, feel free to use whatever nuts your nutty heart desires. Oil: Any mild, light oil will work here, as will coconut oil. I prefer light olive oil or grapeseed oil, but avocado oil is a good choice, as is plain old vegetable or canola oil. 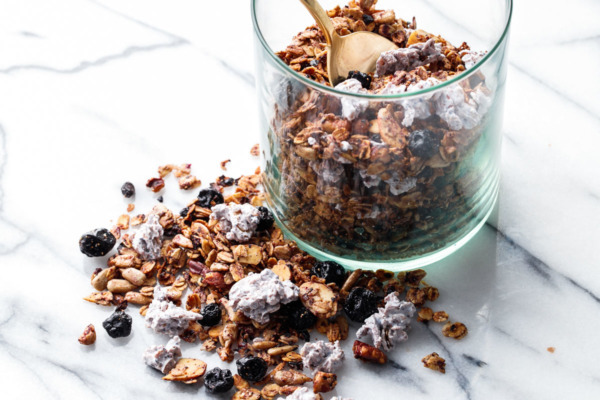 My favorite classic homemade granola recipe gets a triple-blueberry twist: lightly sweetened with maple syrup, with blueberry jam and ground up freeze-dried blueberries, plus dried blueberries and homemade blueberry yogurt clusters. Preheat oven to 325 degrees F. Line a large baking sheet with aluminum foil; lightly spray with cooking spray. In a large bowl, toss together oats, coconut, nuts and sunflower seeds until evenly distributed. Combine blueberry jam, maple syrup, oil and vanilla in a microwave safe bowl or glass measuring cup. Microwave for 45 to 55 seconds until hot. Pour over oat mixture and toss to coat. 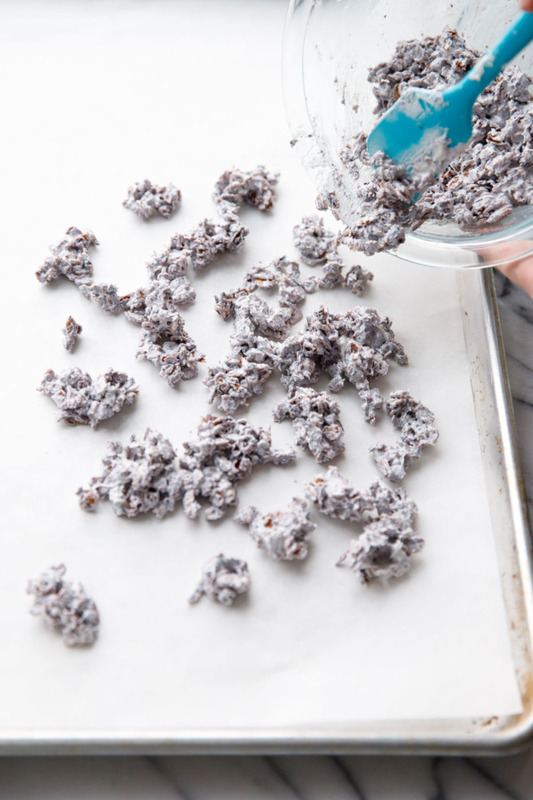 Sprinkle with sea salt and 2 tablespoons ground freeze-dried blueberries and stir until evenly coated. Spread into an even layer on prepared baking sheet. Bake for 45 to 60 minutes; stopping every 15 minutes to stir and redistrubute the granola (the edges will cook faster than the center, so stirring ensures the whole batch gets cooked evenly). Bake until granola is deep golden brown and no longer seems moist; any residual blue tint from the blueberry jam should be baked out at this point too. Watch it carefully during the second half of baking, as it can go from not quite done to burnt in a matter of minutes. Let cool completely, stirring every 5 to 10 minutes to break up any large clumps as it cools. Set aside about 1 cup of granola for clusters. 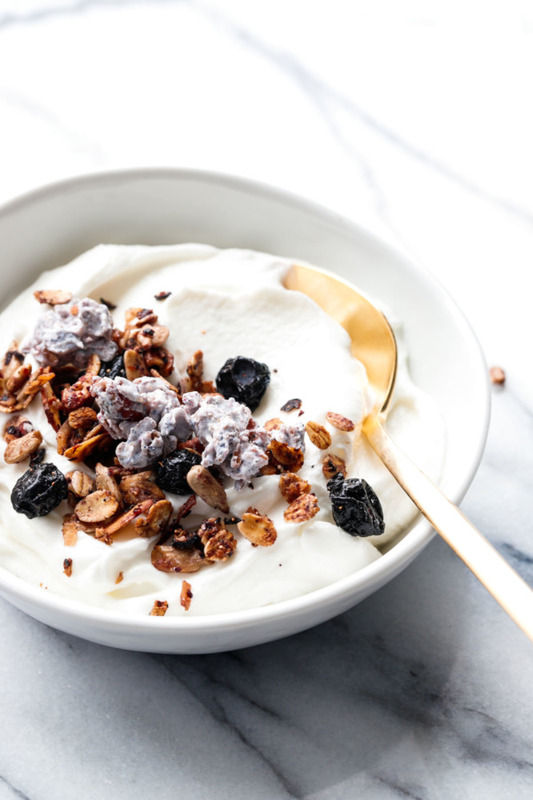 For yogurt clusters, place yogurt chips in a microwave safe bowl and microwave on 50% power, stirring every 15 to 20 seconds, until melted and smooth, about 1 minute. Stir in remaining 1 tablespoon freeze-dried blueberries. Sprinkle in 1 cup cooled granola and fold until evenly coated. Drop bite-sized clusters of oat mixture onto a parchment-lined baking sheet; let cool until set, about 15 minutes. 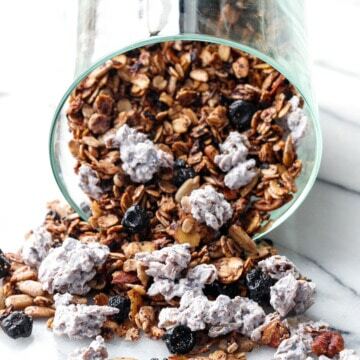 Combine granola with yogurt clusters and dried blueberries. Store in an airtight container in a cool spot for up to 2 weeks. *Grind freeze-dried blueberries in a clean coffee or spice grinder. You can also put the berries in a zip top bag, wrap in a tea towel, and crush with a rolling pin until berries become a fine powder.